I’ve known Dana Ewart and Cameron Smith, the vibrant young couple behind Joy Road Catering since 2006 when they first came to the Okanagan Valley of British Columbia to help their friend Heidi Noble of Joie Farm Vineyards with the orchard dinners and cooking school she used to operate. I was surprised and delighted to find them still in Okanagan the following summer. They had set up a bakery and were selling their galettes, breads, pizzas and buns at farmer’s markets up and down the valley as well as catering events. The following summer, when I returned to find they were still in the Okanagan, my hopes that they had acquired the taste for this place became earnest indeed. Ewart and Smith are classically trained chefs from Ontario’s Stratford Chef’s school and George Brown respectively. They worked in the best restaurants in Toronto and Montreal, including Toque! with the legendary Normande Laprisse. They’ve staged and travelled globally in their never-ending quest to be outstanding in their field. Ewart is effervescent, outgoing and quirky with a side of charm. Smith is quiet, thoughtful, dedicated and deliberate with a side of humour. She bakes like a sugar plum fairy/fiend and never wears matching socks. He is one of Canada’s best foragers. They are both passionate explorers of the natural world, the farms and habitat of their locale and of the kitchens and food around the globe. Theirs is the first stall I seek out Saturday mornings at the Penticton Farmer’s market on my annual trek to the area. My family holds off on breakfast until we can splurge on their offerings like frenzied street food lemmings. I eat a crispy seasonal fruit galette from the cheery checked paper it was handed to me in; while my family pull and lick their way through sticky buns oozing with caramel. Loaves of sourdough are tucked into our market cart along with a jar or two of white peach and ginger preserves. I may or may not have been worthy of such a favour but regardless I found myself praying for a sudden but harmless incident for one of the smarter of our species ticket holders. This year I won’t put my friends through that. I’ll book immediately when I get notice of the summer’s schedule. It’s funny how a friendship can form when you only see someone a few minutes or hours each year. I guess, the fact that I keep turning up at Joy Road’s stall and dinners counts for a lot of it but maybe I ask questions that other people don’t. What’s it like being president of the Farmer’s Market? Where did you travel this winter? Are you raising pigs again this year? What’s your Feast of Fields event like? Whose growing what up and down the valley? Did you find any morels with the rains last week? Slowly, common beliefs, interests and passions come forth and a sort of invisible thread begins to sew ties that bind. To my delight, one day a question came back to me…Would I like to meet this year’s pigs and see the kitchen? Yes, was the answer and here’s a little tour of Joy Road’s HQ from that visit a few year’s ago. When you keep pigs, chickens, gardens, ovens, wines and lots of people on staff, you automatically keep busy. The great thing is that Ewart and Smith also keep cheerful. They seem like the dearest of friends, despite working long and physically gruelling hours TOGETHER. The past few years I’ve attended the Okanagan Food and Wine Writer’s Workshop and the dinner that Joy Road prepared to pair with Tantalus Vineyards wines a few years ago was something I’ll never forget. Tantalus has a gorgeous facility nestled in above Lake Okanagan on the west-facing softly sloping vine covered hills of East Kelowna. With doors open to the setting sun and warm spring breezes floating on those golden rays we dined at a long table haven. We drank with the winemaker and owner of the vineyard while Ewart and Smith proceeded to stun the savvy eaters and drinkers with the elegance of their food. I attended the dinner Joy Road prepared at The Cookbook Co. Cooks last year and I got to host a dinner for them so they could meet some of their peers. They even ate my humble apple pie. I’ll hope to see them again next month and I’ll hope their coming to Calgary becomes an annual ritual. 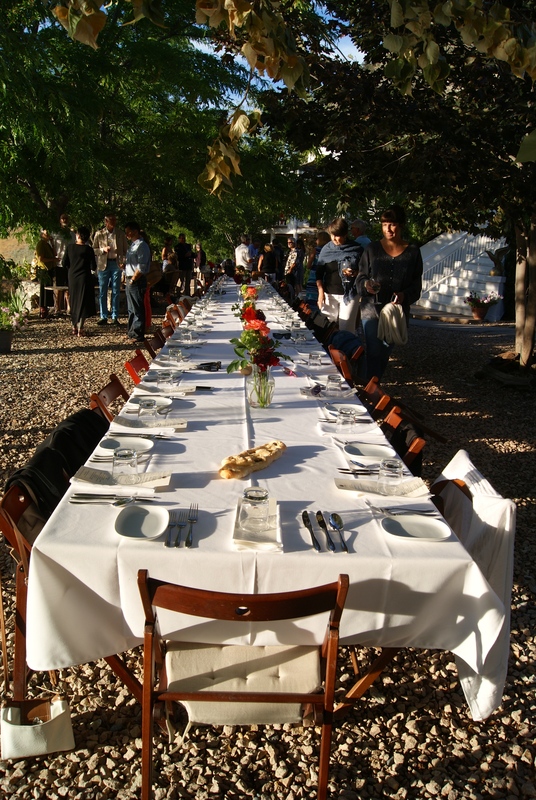 But let me leave you now with a few pictures of my favourite place to meet them; the Al Fresco Winemaker’s dinner series at God’s Mountain Estate in Penticton. It’s my family’s ongoing tradition to go to Penticton every summer. We’ve done it 14 years straight. I hope we’ll have the joy of meeting Dana Ewart and Cameron Smith of Joy Road Catering for many years to come. I value their skills, talent, energy and most of all their friendship. They are two of the finest people I’ve ever met and their dedication to developing the Cuisine to Terroir of British Columbia’s Okanagan Valley helps me Savour it All. Thank you Dana. Thank you Cam. Cheers to you. K.